I THINK I have become the go-to man in Leeds when it comes to the buying of early Christmas presents! There has been a helluva response from my nutty lot who I sell tickets to for my first defence of the IBF world title against Carl Frampton on the Saturday before Christmas. They are very excited about it and, looking at it, it is a massive fight and it will be a good old knees up just before big day. They are very much looking forward to that and thousands will come across to Manchester because it is a bit of an away-day for them. It is going to be a busy period around Christmas time and it will be hard for myself in the respect that it will be my kids’ first Christmas and I am going to miss the majority of the build-up. Some people might not be arsed about that, but I am a family man and I am a bit gutted about it but, at the end of the day, all this boxing is about providing for them and now I’ve got a world title I will get the big paydays in. Every time I win a fight I will cement a bit more of their future, as well as mine. I’ve been asked if I have taken stock of everything that has happened for me this year, what with winning the world title at Elland Road against Lee Selby and now preparing to defend at the Manchester Arena against Carl. It just shows where boxing is at this moment in time and there is a big buzz about it. It is what people want to see, they want to see two top fighters getting it on. Without the bullsh*t as well. Me and Lee had a bit of a thing and sometimes it can be exciting when there is a bit of needle, but with Carl there is mutual respect there. He is a two-weight world champion, a credible fighter and he has all the awards and accolades for being fighter of the year and all that stuff. He believes he is the best, I believe I am – so let’s just fight and see who wins. That is how it should be. Probably the most predictable development in the aftermath of me winning the world title was the suggestion that Lee was dead at the weight. Everyone knew that he struggles with weight and it is one of the worst kept secrets ever. Does Carl struggle with weight? He has come in right on the limit and has failed weight before. There are a lot of fighters who fight at a weight and when they get to an age they struggle to get that last bit off. Lee made the weight and after he said he felt weak and drained, but he didn’t say that before. He has since come out saying for his last five fights he has felt weak, but he wasn’t saying that when he won, did he? I’m a little bit disappointed in the fact that hasn’t shown any respect since the fight and it’s been nowt but the weight being an issue and he has not said I had a good night. 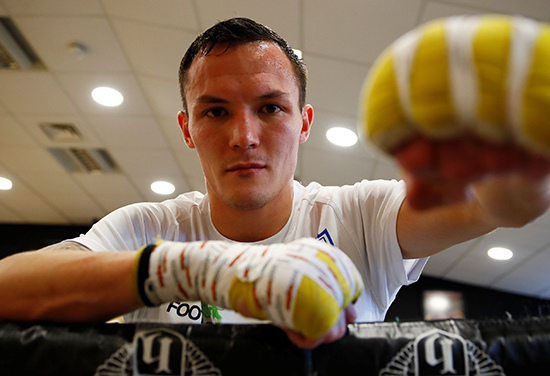 He said it was the same Josh Warrington that he expected. If that was the case then why didn’t he do something different? He never changed his game around and if he knew what I was about then he should have. He was relying on the big, meaty punches that he has when he is sparring at ten stone. Before the fight the biggest thing in his favour was meant to be his size. He was supposed to be this massive featherweight that I would struggle against because he is so strong. When he got in the ring I thought ‘massive featherweight? My right leg is bigger than him!’ I didn’t think he was massive at all. I kind of feel like that when the final bell went, that should have been it and we should have left everything there. But it seems like there is still a bit of needle there and it is a bit annoying. Lee should have let it go at the final bell. He got beat. He can say whatever he wants about the cuts, but these things happen and that’s that. It just all seems bitter.